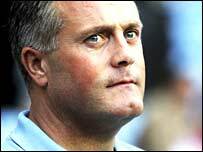 Coventry boss Micky Adams has been sacked in the wake of the FA Cup third round defeat at home to Bristol City. Adams' fate was sealed at a board meeting held at the Ricoh Arena, with Adrian Heath appointed caretaker boss. He said: "I'm devastated and bitterly disappointed. I wish the club every success in the future, but sadly I won't be part of it. "It's not been a disastrous tenure and that's what I can't understand. I felt I could have turned it around." A Coventry statement read: "This is a decision that the board of Coventry City Football Club has not taken lightly. "Everyone at the club has supported Micky 100%, but unfortunately, results have not gone as well as we all anticipated given the substantial investment in the team. "We are committed to our three-year quest to get Coventry City back into the Premiership and believe that tough decisions like this will sometimes be needed to fulfil that aim as is sadly the case today. Adams admitted the sale of Gary McSheffrey to Championship rivals Birmingham City had been a crucial setback. He said: "The sale of Gary McSheffrey was a big turning point for everybody because he is a quality player and you can't replace quality players that easily." Adams will seek a swift return to football after the end of his two-year reign at Coventry. He said: "I want to get back into work as soon as I can." Coventry managing director Paul Fletcher issued an ominous message after the loss against Bristol City left angry fans demanding Adams' dismissal. He said: "Micky Adams is an absolutely lovely guy but it just isn't working for him at present. 606 DEBATE: Were Coventry right to sack Adams? "He is not getting results and that is what he is paid to do. We are all answerable at the end of the day." But Adams refused to criticise the Coventry board, saying: "I'm not here to throw stones at people because I've got too much respect for everyone at the club, including the chairman and the board. "I have been supported as well as I could have been." Coventry's recent slump started with a 5-0 demolition by West Brom and they have earned just one point from their last six league games.